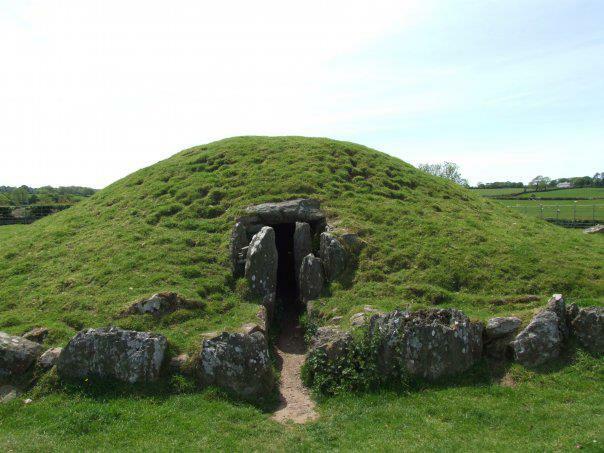 Bryn Celli Ddu means "the mound in the dark grove". It is an ancient burial chamber. Archaeologists have discovered that during the Neolithic period a stone circle and henge also stood at the site. The earth barrow covering the grave is a 20th century restoration; the original was probably been bigger. The burial site is thought to align with the Summer Solstice, unlike many similar ancient sites including Maes Howe and Newgrange, which point to the Midwinter Solstice. Thanks very much Dave for sending me this great photo! The photo is copyright Dave Collis. I've been there and the energy there is beautiful. Anglesey also has many other sites, like an accident village, a really old church and a stone circle. A really good pagan place to visit.